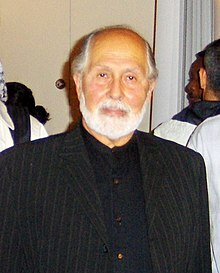 Hossein Nasr (/ˈnɑːsər, ˈnæsər/; Persian: سید حسین نصر‎, born April 7, 1933) is an Iranian professor emeritus of Islamic studies at George Washington University, and an Islamic philosopher. He is the author of scholarly books and articles. Nasr speaks and writes on subjects such as philosophy, religion, spirituality, music, art, architecture, science, literature, civilizational dialogues, and the natural environment. He has also written two books of poetry (Poems of the Way and The Pilgrimage of Life and the Wisdom of Rumi) and has been described as a "polymath". Nasr was born in 1933 in south-central Tehran to Seyyed Valiallah, who was a physician to the Persian royal family, and one of the founders of modern education in Iran. He wrote many essays which still remain in manuscript form, some of which have been assembled by Nasr into a book called Danish wa Akhlaq (‘‘Knowledge and Ethics’’). His parents were originally from Kashan. He is a descendant of Sheikh Fazlollah Nouri from his mother's side, through him is related to the communist Noureddin Kianouri, is the cousin of Iranian philosopher Ramin Jahanbegloo as well as the father of American academic Vali Nasr. A scholarship offered by MIT in physics made him the first Iranian undergraduate to attend that university. There, he also began studying under Giorgio de Santillana and others in various other branches such as metaphysics and philosophy. During his studies there he became acquainted with the works of the Traditionalist authority Frithjof Schuon. This school of thought has shaped Nasr's life and thinking ever since. Nasr had been a disciple of Frithjof Schuon for over fifty years and his works are based on the doctrine and the viewpoints of the perennial philosophy. After receiving an MIT SB degree in physics in 1954, Nasr obtained a master's degree in geology and geophysics in 1956,[where?] and went on to pursue his PhD degree in the history of science and learning at Harvard University. He planned to write his dissertation under the supervision of George Sarton, but Sarton died before he could begin his dissertation work and so he wrote his dissertation under the direction of I. Bernard Cohen, Hamilton Gibb, and Harry Wolfson. At the age of twenty-five, Nasr graduated with a PhD from Harvard and completed his first book, Science and Civilization in Islam, the title being a direct tribute to Science and Civilization in China, the work by Joseph Needham which had for task to present to Westerners the complex developments of the history of science and technology in China, a mission Nasr was himself following for the Islamic civilization, "although I was working single-handedly, a twenty-five-year-old scholar, and he had a whole group working with him at Cambridge". His doctoral dissertation entitled "Conceptions of Nature in Islamic Thought" was published in 1964 by Harvard University Press as An Introduction to Islamic Cosmological Doctrines. Apart from mastering Arabic he was initially taught in his childhood, during his student years, Nasr also learned different languages, namely French (he could read Guénon and Schuon in the text), Greek, Latin, Italian, Spanish and German (mainly to work on Hegel for his PhD thesis). After Harvard, Nasr returned to Iran as a professor at the University of Tehran, and then at Arya Mehr University (now Sharif University of Technology), where he was appointed president in 1972. Before that, he served as Dean of The Faculty of Letters, and Academic Vice-Chancellor of the University of Tehran from 1968 to 1972. Nasr also learned Islamic philosophy from the philosophers Muhammad Husayn Tabataba'i, Sayed Hassan Al-Qazwini and Sayyid Muhammad Kazim Assar during that period leading up to the revolution. Nasr was appointed personal secretary to Farah Pahlavi, Empress of Iran, as Head of the Empress's Private Bureau. In 1974 she commissioned him to establish and lead the Imperial Iranian Academy of Philosophy (now the Institute for Research in Philosophy), the first academic institution to be conducted in accordance with the intellectual principles of the Traditionalist School. During that time, Nasr, Tabataba'i, William Chittick, Kenneth Morgan, Sachiko Murata, Toshihiko Izutsu, and Henry Corbin held various philosophical discourses. The book Shi'ite Islam was one product of this period. ^ John Hart (ed. ), The Wiley Blackwell Companion to Religion and Ecology, John Wiley & Sons, 2017, p. 328. ^ "How Freelance Diplomacy Bankrolled by Rockefellers Has Paved the Way for an Iran Deal". Bloomberg.com/politics. Retrieved 2016-04-01. ^ a b c "Google Scholar Page". ^ Sheikh, Nadia. "Islamic scholar calls GW home" Archived 2011-07-11 at the Wayback Machine, The GW Hatchet, February 20, 2007. Accessed February 5, 2011. "As a 12-year-old, Nasr came to the United States to study at the Peddie School, a New Jersey boarding school where he graduated in 1950 as valedictorian." ^ a b "Biography / Dr. Seyyed Hossein Nasr". Nasr.org. 1933-04-07. Retrieved 2013-09-26. ^ "upf.tv". upf.tv. Retrieved 2013-09-26. ^ Lewis Edwin Hahn (ed), The Philosophy of Seyyed Hossein Nasr, Library of Living Philosophers, Volume XXVIII, Open Court, 2001, ISBN 0-81269-413-9. ^ "Press Release Archive: University Professor Seyyed Hossein Nasr Wins Award For Best Course In America In Science And Religion". Gwu.edu. Retrieved 2013-09-26. ^ "Knowledge and the Sacred, Seyyed Hossein Nasr". 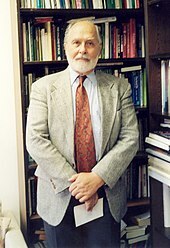 giffordlectures.org. 1980. Retrieved 2015-10-28. ^ a b "Sacred Web Conference contemplates the role of religion in a secular age". The Vancouver Observer. Retrieved 2016-04-01. ^ Sedgwick, Mark (2004-06-03). Against the Modern World: Traditionalism and the Secret Intellectual History of the Twentieth Century. Oxford University Press. p. 8. ISBN 9780199744930. ^ Seyyed Hossein Nasr. "Gifford Lecture Series - Lectures/Books". Giffordlectures.org. Archived from the original on 2013-09-23. Retrieved 2013-09-26. This page was last edited on 6 April 2019, at 19:21 (UTC).